Joseph P. Garner, our beloved husband, father, grandfather, and great grandfather, passed away peacefully Tuesday, May 23, 2017 in Mesa, Arizona. Joseph was born to William Lawrence and Lottie May Pincock in Sugar City, Idaho, September 8, 1921. He graduated from Sugar Salem High School in 1939 and worked several jobs during the summer months, including time spent in Jackson Hole, Wyoming working as a bellhop at the Wort Hotel. After receiving a scholarship and from money he had earned, Joseph attended the University of Idaho in Moscow. He worked several jobs in between his study and was able to graduate with a Bachelor of Science Degree in Agriculture Economics in 1947. He served in World War II from 1942 to 1945 as a B-17 pilot, completing 35 bombing missions over Germany. He served 20 years in the reserves and retired as a Major in the United States Air Force in 1966. He was proud of his military service and loved his country. After the war, Joseph married Loris Leona Johnson on September 4, 1946 in Idaho Falls, Idaho. Their marriage was later solemnized in the Salt Lake Temple. She was the love of his life and their marriage of over 70 years stands as a legacy to all. They moved to Preston, Idaho where Joseph worked and later managed the Federal Land Bank Association for 37 years. Joe and Loris loved Preston and made it their home for over 66 years. A special highlight of his career was being chosen one of two Federal Land Bank managers in the country to appear in Washington D.C. before the Senate Agricultural Committee to give testimony at the hearings in support of the 1971 Farm Credit Act. Joseph’s efforts were effective in passing this most important legislative endeavor supporting farmers throughout the country. 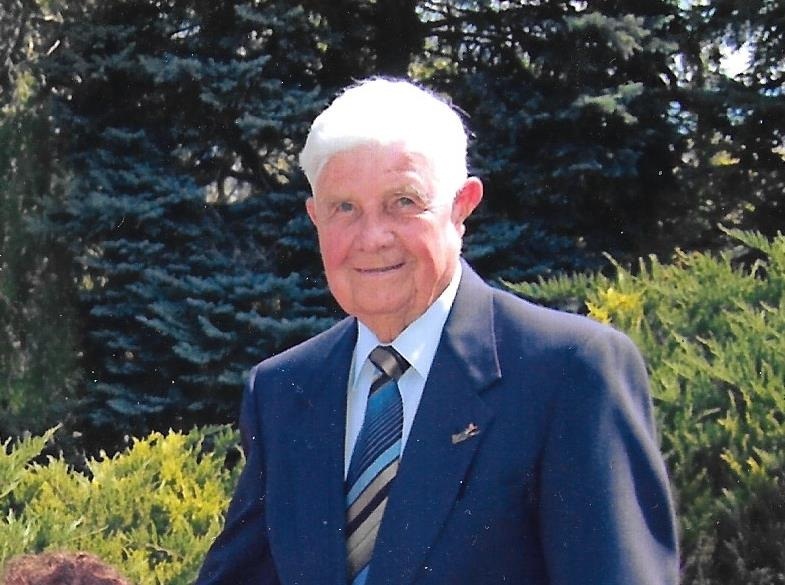 Joseph was very influential in his community serving as President of the Rotary Club, President of the Chamber of Commerce, member of the Lions Club, and serving for over ten years on “The Famous Preston Night Rodeo” committee. He served on the governing board of the Logan Hospital renovation for several years. He made several trips to Boise, Idaho to meet with the Legislature to promote various developments in Southeastern Idaho and served on the Chamber Agriculture Committee numerous times. He was one of three prominent citizens of Preston who developed the Preston Golf Course where he served as the first treasurer and helped design and seed holes 8 and 9! Joseph served faithfully in the Church of Jesus Christ of Latter Day Saints. He enjoyed his calling as Bishop of the Preston 5th Ward, feeling genuine love for his members, particularly the children and youth. His compassion and service deeply influenced many lives. He also served as Stake Clerk under two Stake Presidencies for over 18 years. He loved attending the temple and found joy in family history work. He was tireless in his service to his fellowmen and was committed to his faith and left a testimony of his devotion to his Savior for his posterity. Joe and Loris retired to Mesa, Arizona where they had many great memories with friends and family. As children we will miss his kind and gentle ways, his optimism, his love for others, his work ethic, his love for God and Country. He was a devoted husband and father and his desire was to endure faithfully to the end… which he did. He was preceded in death by his parents, seven siblings and his granddaughter, Taylor Otteson. He is survived by his wife, Loris, two sons; J Lance Garner (Saralee), J Bradford Garner (Kathy), daughter Jody Lynn Otteson (Kevin), 12 grandchildren and 28 great grandchildren. What a wonderful tribute to Joe. He was a very special person to his family and everyone he met for sure. So glad to have gotten to know him over the years. He will be missed dearly by so many. I will always remember his sparkly blue eyes and his amazing laugh. Love to all. What great memories I have of visiting Uncle Joe and Aunt Loris and Lance, Brad, and Jody in Preston. Always a highlight of the summer as we kids grew up. Our heartfelt condolences to you all. You’re in our thoughts and prayers. We will miss him. We are grateful to know Joe and Loris, some of the finest people we have met. Joe is a generous and loving man, and we will miss him. What a wonderful legacy! We are so happy to have known this special man. Love and prayers to you all. Loris, it is an honor for Adriana and I to have known your husband. His joy of life and honor and service to his family, community and our country was evident. He will be missed as a part of the “Great Generation”.